Another change has been made to the upcoming UFC on Versus 3 fight card. Maiquel Falcao has been forced off the card with an injury. Stepping in to replace him against Alessio Sakara will be Renzo Gracie student Rafael “Sapo” Natal. The change was confirmed to MMAWeekly.com by sources close to the fight on Friday, with bout agreements issued for the new match-up. 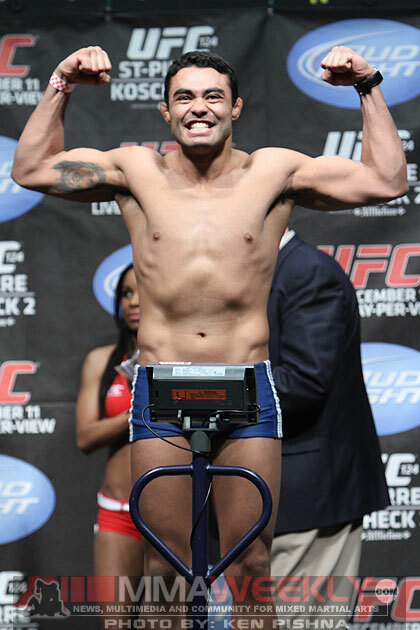 Rafael Natal makes his third appearance in the UFC, and hopes to notch the first win under his belt as well. Natal fell short in his debut fight against Rich Attonito, and then fell prey to a very rare draw in his next bout against Jesse Bongfeldt at UFC 124 in December 2010. Stepping in as a replacement, Natal will look to get his first victory when facing American Top Team fighter Alessio Sakara. According to sources, the bout will remain on the televised portion of the UFC on Versus 3 broadcast.